This is sort of related to another blog post I wrote a while ago (which has since been revealed to have come to fruition). I hinted at this particular issue in this blog post and although there’s already been a lot of discussion on this issue, I have a few thoughts to share on the topic. The internet’s founding principle is on the idea that all information can be accessed equally. Throughout the years, this has been challenged and attack by various administrations under the control of the deep state. They have failed so far, but based on this latest threat, they are relentlessly at it again. The concept of equal access to the internet is under threat by the Trump administration’s FCC. A Vote is scheduled to take place on December 14th that would fundamentally change the way the internet operates. 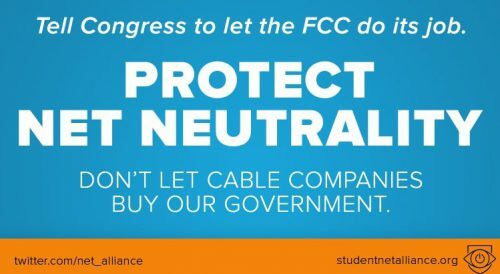 By allowing a slim 3-2 panel to destroy the government’s commitment (even if it is only half-assed) to allowing equal access to online content for everyone, the new landscape will enable ISP’s (internet service providers like Verizon and Time Warner) to do the dirty work that the deep state is having trouble accomplishing on its own. By eliminating important regulations protecting equality, this is creating an environment where data throttling, blacklisting and surcharges on internet access will make the internet unaffordable to most Americans and utterly useless in getting real information about the world we live in. It would also effectively shut down our site as we would lose the very little traffic we have left. There’s two avenues to protecting net neutrality and saving our website from censorship; the courts and the public. The courts will likely uphold some of the founding principles of net neutrality, but it may not uphold all of it. That’s where the public (you) comes in. You all have to be willing to cut the cord on cable and pull your money out when these things begin to happen. Doing so will spook the ISP’s (and the deep state too) and ultimately see the worst threats of an unregulated internet fail to come to fruition. It’s important for the future of this website and all of the internet that the public gets involved on this issue. For the sake of the future, we must fight for it now. As the year is beginning to come to a close and the holiday season approaches, my prescience for the remainder of 2017 narrows and begins to float in 2018 instead. This and next months posts will be shorter as I prepare for the mega 2018 post plus a fulfillment chart for my 2017 predictions. In the meantime, I have one warning to share. I’ll add anything below if it becomes necessary. 1) There is the risk of a terror attack at a Thanksgiving day parade or event this year. I don’t think it’s the Macy’s event, but it might be. Instead, it’s more likely to be one in a smaller town or city near the west coast. Watch out for it as the time approaches. 11/17 ETA: A few more predictions to share. 2) If former Fifth Harmony singer Camila Cabello goes number 1 either this week or next and then scores an additional #1 in 2018, don’t expect a reunion of the group to ever occur in the future. 3) In addition to prediction #1, I think there will be some additional trouble during the Thanksgiving holiday weekend in regards to violence and other issues, mainly political ones. It will be a tumultuous time and not such a pleasant Christmas. 4) Finally, I know I’ve said this a bunch of times before, but like with warnings of political violence that have been fulfilled numerous times, I still believe the economic weight is going fall out from under New York City with some severe rioting and housing busts to blame. I also believe scandal and political violence will plague the city as well. This comes as both Chicago and San Francisco face similar issues. 11/24 ETA: Thankfully there was no attack during a Thanksgiving day parade (as far as I know), but violence has begun to take hold this weekend and it will get worse as we approach Saturday. In the meantime, here’s another prediction to share. Stay safe. 5) There will be another high profile anti-gay attack in Europe, this time in Amsterdam. I believe it will occur at the airport, the perpetrator will be Muslim and the victim will be a tourist. Watch out for this in late December. 11/26 ETA: Possibly the last prediction of the month, but I don’t know 100% for sure. 6) The lid is about to blow off on Amazon’s horrible employment practices including its abuse of workers, sexual harassment and environmental pollution. This will lead to congress sanctioning Jeff Bezos and seeing his ouster come from the organization by the end of 2018. 11/29 ETA: This is most certainly the last prediction of the month. I don’t think I saw this one anywhere else and believe it is mine exclusively. 7) I feel that an undercover tape is going to be released from a disgruntled ex-employee of Ellen Degeneres showing her nasty diva antics backstage of her talk show. Although I don’t believe it will derail her career or see the cancellation of the show, I do believe that she will lose endorsement deals and sponsors will pull out as a result of the controversy. I think this incident will prompt her to begin plans to fade into the background as she approaches sixty years old.